There are three main types of e liquid and they are PG, VG and Mixed. These three versions of e liquid are extremely important when it comes to buying your e-liquid. They affect the flavour and power of vaping. Below is a guide to the different types of e liquid available. PG is the more widely used e juice as it offers more of a ‘throat hit’ which vape smokers like, its also very thin so it doesn’t clog up your atomizers and burners. There are some concerns about the usage of Propylene Glycerol in e liquid as some people can develop allergy reaction to the PG (only a small few have been reported) but in spite of this PG is still the main commercial e liquid for electronic cigarettes. All in all PG does produce the all round better vape. 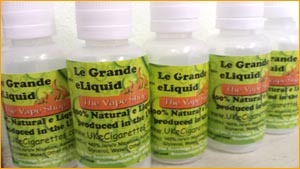 VG e liquid (Vegetable Glycerine) is reported to be completely safe within the vape smokers forums and also adds a more sweeter taste to the e liquid. There are also no reported cases of anyone having allergic reactions, or any health concerns voiced around the forums using VG e juice. Using VG is reported to produce a less powerful throat hit and is more ‘gluppy’ than PG so it can reduce your atomizer working life span. There are a lot of e liquid providers as well as users who mix PG with VG. The most common percentage of splits are: 74 / 25 (PG-VG). Nicotine strength is measured in milligrams per ml (mg/ml) not per bottle. There are about 20-40 drops per milliliter, and this differs with each size bottle or dropper. All nicotine cartridges and E-liquids must be kept in a safe place locked away from children and pets at all times. NICOTINE IS A POISON. NICOTINE IS HARMFUL. KEEP OUT OF REACH FROM CHILDREN AND LOCKED AWAY IN A SAFE PLACE. IF ANY NICOTINE PRODUCT IS CONSUMED, SEEK MEDICAL ASSISTANCE IMMEDIATELY. The Vape Shop produces a range of quality UK manufactured e liquid products for use with electronic cigarettes.